Find out what I'm doing, where I'm going, and how to buy my latest CD, Be Still. Daniel Mount reviews "Be Still"
I want to say "thank you" to Daniel Mount for taking the time to listen to my CD and review it. I must say he was very kind. If you have a minute to read his thoughts, please click on the link above and leave a comment when you finish. Click here to purchase/download "Be Still"! God bless, and enjoy the weekend. I get to celebrate my son Gideon's 6th birthday. Crazy kid wanted fondue and cupcakes (not at the same time, I'm pretty sure). Hi, you have reached my "website". Yes, I know it is a blog. But with so many media outlets online today, I like the simplicity of a blog. I just might keep it this way for awhile. If you want to see pictures of what I have been involved with lately, please go to www.facebook.com/priskvocalstudios and Like my page. I will post upcoming events on this Blog and on my Facebook page, so you won't miss a thing. I am blessed to be able to use my voice for God's work here on Earth. I hope that you feel the same way about whatever God has given you to do. I was challenged by an evangelist who spoke in our school's chapel this morning. He asked "why would we ever want to do anything less than our best? Are we half-speed Christians or full-speed Christians?" (he is the chaplain for the South Carolina Gamecocks football team) I want to be a full-speed Christian and share the Gospel and my testimony wherever I can. Will you do the same? I hope Jesus Christ means that much to you. Feel free to leave a comment and make my blog look like someone actually reads it. I know there has to be at least one out there. I had an incredible experience last night. It has been awhile since I've had the opportunity to perform in a major production and I realized in the middle of everything last night that I very much enjoy it. Not because I want to be seen on a stage, but because it is a rush to put on a live performance, knowing that if you don't do your part correctly others will be effected and you also have to react to situations as they constantly change, no matter how much rehearsal time you have. Greg Howlett (www.greghowlett.com) is a friend of mine who has already released 5 CDs and one DVD and this new release, scheduled for Thanksgiving, will be the best one yet. He teamed up with Steve Mauldin again for his orchestration and vocals and included a band that was amazing. Knowing that I would get to introduce the refrain of one song to the audience, I was looking forward to helping out. Once I got to the stage he made me sing "I'd Rather Have Jesus" off my new album and then asked if I would sing a verse of "Great Is Thy Faithfulness" and include the audience. I must say that he didn't have to twist my arm, and I am very thankful for the opportunity he gave me. Please go to Greg's website and find out more about him. You'll be glad you did. Click the link above to hear a sample of Be Still and Know. Please leave some comments and let me know what you think. Pre-order before July 27th and receive your own signed/numbered copy (up to first 100). 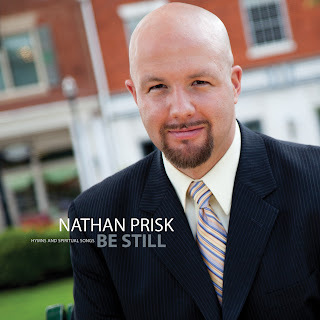 New Solo CD -- "BE STILL"
My new CD is almost ready to ship. It will release on Friday, July 27th. On July 29th I will be in San Antonio, Texas with the Daybreak Quartet where folks will be able to buy it for the first time. I am holding onto the first 100: however, for those who pre-order it. Pre-orders will be signed and numbered (which will actually make them worth even less because I will have destroyed the original artwork with a Sharpie). The decision to make a solo CD is one that I've been mulling over for years. I have had conversations with friends in the past about how I was able to schedule concerts for the quartet for so many years. I answered this easily because when I would call to promote the quartet, I didn't have to talk about myself...I could mention the other guys, talk about what they had done and why we would do a good job. For me to call and promote myself (only me) and try to paint a good picture is a lot more difficult. First of all, I know myself. Strike One. Secondly, I have always shied away from building up myself. My goal as a Christian and a musician is to utilize the gifts that God has given me. I have developed those gifts so that I can worship Him and tell what He has done for me, particularly sending His Son to die on Calvary for my sins. I have nothing in and of myself that I can promote. Strike Two. As for Strike Three, I don't think I've completely struck out, but not for trying. I finally produced this project because I felt I could be an encouragement to someone. I have been blessed by the music of countless musicians over the years, and I am praying my music will also be a blessing.I love the hymns that speak of God, His holiness, His comfort, His power, His guidance, and His faithfulness and so I included many hymns on this CD. People have asked why I didn't record more of the newer southern gospel songs. Maybe I will one day, but the songs listed below are the ones that have spoken to me at different points through my life. I hope that you will keep up with what I am doing and if I do ever end up somewhere close by, please come out and say hi.